Even though it’s a short and light read and I couldn't fully connect with the characters, there is something with this book. Something that made me keep on going, loving every moment of it. It’s written in such a way that has me intrigued. 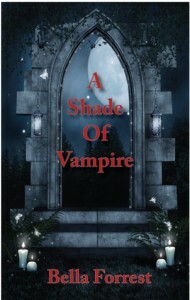 I liked how in this book the vampires are more brutal, closer to the evil beings they once were for our ancestors. Cause you won’t find any “vegetarian” vampires, or soft, docile ones. Nope, we’re back to the beginning when vampires were at the top of the food chain and humans their food. Theirs to do with what they wanted. And it is a delightfully refreshing way to look at vampires. The story is told through both Derek and Sofia. As I said I had some trouble connecting with the both of them. I just could not feel any depth in their emotions. My heart did not race in my throat and I could not bring myself to truly care. Other then that it was fun reading about them. Sofia started out as a true wallflower, but she gradually became more comfortable and had no problem with telling what she felt. And it was great to see her grow like that. 4 HEARTS. There’s just something with this book that will make you like it. Even thought it’s a short story and the emotions the characters experience don’t really come across. The not so fluffy vampires also help add to the appeal. Sofia, a blossoming wallflower and Derek, an unusual vampire make the magic complete. I look forward to the next installment!